Things that have mattered emotionally, often for the quality of their pattern, their beauty, their emotional shape, things that are not necessarily traumas, lodge in the mind, becoming shadows until you sit at a desk and begin to work out a pattern of words and images and then they become substantial and they block the way of narrative progress until they are allowed onto the page, or they offer the narrative great body and substance until they become the secret subject of the book. Colm Tóibín quoted in an Irish Times review of All a Novelist Needs: Colm Tóibín on Henry James. Ramona Koval: You say modernists look with horror at the proliferation in modern culture of both fantasy and realism, both Tolkien and Graham Greene, both Philip Pullman and VS Naipaul, out of respect for the world. Tell me what this horror entails. Why? Gabriel Josipovici: The last part of that phrase is something that I touched upon when I was saying that this is not simply a clever modernist trick that springs from a desire to make the reader see that everything that can be said about the world is still going to leave a lot unsaid which is there in the world. So, in a way, they are trying to make you ... just as much as the lyric poets are trying to make you ... see the world itself as it is out there, and what I was saying there was I think this proliferation of fantasies from Tolkien through to the Harry Potter books and Philip Pullman and so on, is a curious sort of indication of the way in which we would rather just turn away from the world and live in pseudo myths and mythologies, and they are pseudo, they're not the real thing as they were in cultures that really had myths and really believed in them. And similarly I think straightforward realism also stops you actually recognising this mysterious thing that our lives are open, are not going to be subsumed in a narrative we can easily tell, but we are constantly going to come up against something which is much more mysterious, much stranger, much more un-inchoate than we imagine. Part of a transcript from interview on ABC Radio National of Australia about Josipovici's What Ever Happened to Modernism? In order to describe a novel to someone who has not read it, you can simply summarise the story it tells, excluding by necessity perhaps hundreds of pages presenting a unique authorial voice, rich and memorable characters, exotic locations and significant pivots of plot. Yet, if asked to describe a poem, you could merely recite the words, arriving at the destination immediately; no need for any bright signposts. In general we can accept the failings of the former method as a necessity, perhaps even desirable because keeping distance can save time and trouble. But the distinction presents itself with unexpected urgency when charged with describing Mathias Énard's novel, his fourth book and the first to be translated into English. Zone needs to be recited; one needs to be submerged in the disturbing pace of its narrative and disruptive power of its detail to appreciate why a summary is both easy and impossible. Zone is an account of a train journey between Milan and Rome made by Francis Servain Mirkovic, a Croat in the pay of French intelligence, with a view to selling an archive of documents packed in a suitcase. The documents contain "names and secrets", testimonies from the terrible history of the lands surrounding the Mediterranean – the Zone of the title; events of which Mirkovic is both part and partly responsible as, in his youth, he fought in the civil war that tore Yugoslavia apart. In those days he was immersed in youth, in the thrilling moment of war, in violence and in comradeship, yet now, a paid informer with a false identity, he is not only friendless but separated even from himself. Mirkovic's voice, despite tumbling headlong onto the page in a continuous sentence, is still that of writing, both light enough to carry us forward, above the fray and relieving us of the past and future, yet also heavy with all that the words signify. The archive is heavy on the soul of Mirkovic the traveller, the escapee, because he discovers history is not temporal – all our yesterdays – but spatial. Ghosts from innumerable wars appear and disappear like disused stations, and tortured lives and gory deaths reverberate through the cage of narrative like thousands of sleepers. It is an experience of history explored most notably by WG Sebald, as highlighted by Will Self, and, if pushed to further the comparison, Zone has the quality of a highly fevered Sebald. But its other antecedents are clearer. The novel's title comes from Guillaume Apollinaire's 1913 poem which shares the novel's decapitations, stream-of-consciousness narrative and drunken narrator and its 24 chapters match the number in that other great story of war, the Iliad. Zone is a literary novel because the documents themselves are literature and because the names that arise in Mirkovic's memory and discussed throughout the novel, authors as various as Ezra Pound, Malcolm Lowry, Robert Walser, Genet, Proust, Celine and William Burroughs, are his fellow travellers. Literature is heavy because of its objectivity, the manner in which human life flares and disappears in a moment. But Zone is literary in a less abstract sense too. Mirkovic sits opposite a Czech businessman feverishly consulting a thick paperback, what turns out to be a catalogue of timetables giving precise details of where and when every single train stops. Like the archive, it is a record that "allows you to know what we could have done, what we could do in a few minutes, in the next few hours, even more, the little Czech man’s eyes light up, all eventualities are contained in this schedule, they are all here". All eventualities will end somewhere. Everything in the world exists in order to end up in a book. The rigour of the catalogue's certainty is bracing and there are those, like the Czech, who relish the cold and those, like Mirkovic, who shiver. This is dramatised at the start of the journey by the cry of viva la muerte, long live death, uttered by José Millán-Astray, the one-eyed Falangist general, in his famous exchange in 1936 with Miguel Unamuno, the Catholic philosopher and "strict high priest of culture" who, in a futile speech against the coming massacre, warns the fascist that "You will succeed, but you will not convince". Mirkovic succeeded too, surviving the civil war and with the prize of an independent Croatia, but he's not convinced. The weight of the Zone's history dragging Mirkovic down is a reminder of Nietzsche's essay On the Use and Abuse of History for Life that argues in favour of a history that serves life rather than binds it to erasable memory. It's why Mirkovic's reading matter may prompt the accusation that the book is nothing more than a pathological indulgence in others' misfortunes. Nietzsche resisted monumental and antiquarian forms of history, giving equal importance to forgetting in the lives of individuals, communities and cultures. Mirkovic's nonstop narrative might then be seen as an unhealthy Schadenfreude and self-pity over what his pursuance of war and profit has cost him and others. Yet while we may take this view, we too are implicated in being provoked to prefer forgetfulness over remembrance and the repetition of history this threatens. Zone draws our attention to the web stories weave when its stream-of-consciousness is interrupted by chapters of another book that Mirkovic has in his possession. A writer called Rafael Kahla tells the story of Intissar, a Palestinian fighter resisting the Israeli onslaught in Lebanon. Her lover Marwan has been killed in a firefight and she has to carry on, rifle in hand, lamenting his death whilst remaining true to the cause in the tradition of warriors fighting for a nation's independence. It's a sad and dignified story written with familiar punctuation and in free indirect speech; a work of fiction within a fiction reminding the reader of the longing to make something redemptive in death that overtakes both people and novels. (In fact, Intissar's story is very similar to From A to X, John Berger's grossly sentimental novel of 2008 celebrating the stifled lives of revolutionaries on either side of a prison wall.) However, the contrast to Mirkovic's narrative and to the Iliad is not in its style but its boundless pathos. Where Zone's pages leap over rows of headless bodies and the Iliad describes violent death with swift and terrible lyricism, Intissar does not let go, wanting to retrieve Marwan from death, going so far as to risk another firefight to recover and then bathe his stiffening body. Mirkovic's present might be said to be one in which unresting death is faced when the attenuated husks of religious or nationalist myth have been breached. Mirkovic is the exposed core and the choice between memory and forgetting is impossible; a brilliant future depends on both. His existence in writing – sustained, incessant, brutal, resourceful to the brink of insanity – thereby becomes necessary for survival. Everything is coursed into a recital, a unique poetic ritual of mourning to reach the destination that is itself. 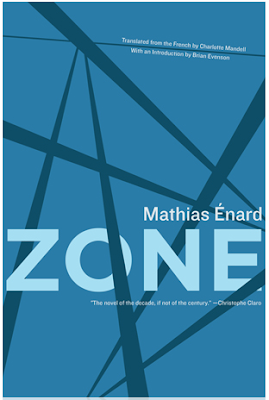 Zone is indeed soaked in trauma yet, in Mathias Énard's hands and Charlotte Mandell's fluid translation, it is exhilarating, and has to be read. Peter Handke has given a wide-ranging interview (in German) to Die Zeit prompted by his latest book Ein Jahr aus der Nacht, made up of 365 "dream notes" written upon waking, and the play Immer noch Sturm (Still Storm, apparently alluding to King Lear) "concerning the USA's disputed commitment in Bosnia". He also has much to say about contemporary US literature. To the latter I shall have to limit this post. What he says is worth comparing it to the critique offered by Gabriel Josipovici in What Ever Happened to Modernism? which, as if it were idiosyncratic, has been placed in quarantine by UK literary gatekeepers. As the interview has yet to be translated, we will have to rely on web translations. (Were he only a mediocre Peruvian neo-conovelist instead it would be on the Guardian Books pages tomorrow!). I shall update the translations should anyone be so kind enough to correct or explain (ij. van den berg of boeklog has already helped me so far). The sorrow of people is so great! If you could only hug them all! But there is no one to embrace them all. We are talking only about my stepfather, and so on: One of the most beautiful sentences I've read is by John Cheever: telling is not retelling. To tell a story is a revelation. In every story, even if it is very real (i.e. avoiding the word 'realistic'), there must be a revelation. You have to be able to see something other than the canonical. The reader must discover something of the human what he may have known yet was not clear. Otherwise there is no book, no story. I am telling you this because I have the feeling that you're leading me down the trail of retelling. Revelation is telling, even for one who tells. He, too, must be surprised by what he says. He goes on to say "There is nothing as intimate as the religious prose of John Cheever in his diary." Die Zeit then asks whether he likes American literature. Not the younger writers. Again and again I think: How nice literature would be without all of these journalistic, family and society novels. Fontane was perhaps able to do these, but today it is a sunken form. I have translated Walker Percy's novels The Last Gentleman and The Moviegoer; he is a great author. And I love Thomas Wolfe's novel Look Homeward, Angel. These books have something lyrical, which is essential. In Jonathan Franzen's novels, however, it does not happen at all. He follows a knitting pattern. Even Philip Roth is ultimately only a funny MC. Reading should still be an adventure. In a book, even in a social novel, the language must be the movement in search of it. Epic literature needs a lyrical element. But that has totally disappeared from American literature. Eruptions are needed, a controlled letting go, not this prescription-like writing. It must come from the author, whether from his fornlorness or from his pain. When you see the author do this only to avoid word-mongering, it is not enough. A curious coincidence is that another Austrian great Thomas Bernhard was, in his youth at least, greatly impressed by Thomas Wolfe and even translated a play. Finally, Handke responds to the interviewer comparing the humour of the dream notes to that of Kafka, an author to whom Handke has not always been sympathetic. It is always said that Kafka's readers laugh because his prose is so humorous. No, they laughed not at the joke, but at the truth. If something is striking, then one laughs. Humour is, after Goethe, an indication of a declining art. Kafka's art is so pure that it is true. At this, one must laugh. For Handke, a paragraph is enough. Worth bearing in mind when enduring the hair-raising wrongheadedness of Prospect Magazine on the same subject. From an interview at Big Other conducted by Greg Gerke with James Longenbach, poet and author of Wallace Stevens: The Plain Sense of Things. Longenbach: This is a hard question, and I’m not sure if today I’d answer it the same way I would have twenty years ago, when I wrote my book about Stevens. One person’s intense engagement with the most visceral aspects of life is inevitably going to look to another person like retreat or denial. Somebody like Jim Morrison represents one kind of lived intensity, but somebody like Wittgenstein represents another. I think Stevens had real doubts about the shape his life ultimately took; increasingly, his poems seem to me at times unbearably sad: “Her mind will never speak to me again.” (Sixth line of “Farewell to Florida” – a gorgeous pentameter!) But he also made something extraordinary from the limited means of himself, and that’s what we all do, or try to do. In some ways, Stevens lived with an intensity that terrifies me. What we are speaking of here is unfathomable, we are not properly alive, our existence and suppositions are all hypocritical, we are cut down in our aspirations at the final, fatal conclusion of our lethal misunderstanding with nature, into which science has led us and abandoned us; appearances are deadly and all the hundreds and thousands of hackneyed words we play with in our heads in our loneliness, the words that are recognizable to us in any language and within any context as the monstrous truth revealed in monstrous lies, or better, monstrous lies revealed within a monstrous truth, the words we say and write to one another and the ones we dare suppress, the words that come from nothing and go to nothing and serve nothing, as we know and keep secret, the words to which we cling because our impotence makes us insane and our insanity makes us despair, these words merely infect and ignore, blur and aggravate, shame and falsify and cloud and darken everything; by mouth and on paper they abuse by means of their abusers; the very character of words and their abusers is an outrage; the spiritual condition of words and their abusers is that of helplessness and catastrophic good cheer. This is the first part of Thomas Bernhard's speech accepting the Büchner Prize in 1970, to be found in My Prizes translated by Carol Brown Janeway. See also David Auerbach's telling response to Michael Hofmann's review of Old Masters. Enough of Bernhard as ranter. Ten years earlier, Paul Celan gave an acceptance speech for the same prize which we know as The Meridian. You can download extracts from Pierre Joris' forthcoming translation of the critical edition at Jacket Magazine. And we English wonder why some accuse our literature of interminable mediocrity! Enlarge art? No, on the contrary, take art into your innermost narrowness. And set yourself free. I have taken this route with you today. It has been a circle.